I have fallen woefully behind on Penhaligon’s — and on many other brands as well, but right now I'll focus on Penhaligon's. Someone do comment if any of the four fragrances in their Trade Routes collection (Empressa, Levantium, Lothair and As Sawira) are absolute-must-tries, otherwise, they will remain four more faceless (smell-less?) entities in the sea of niche releases. Who can keep up? As I've said in the past, I'm a bit lukewarm about Penhaligon's anyway. They do a good job at what they do, but what they do, with one exception, doesn't especially suit me. The latest, Ostara,1 got my attention because a) it's narcissus, and b) the graphics are pretty (yes, I'm that shallow) and c) it's perfumer Bertrand Duchaufour, but a solar floral fragrance that promised to "capture the optimism and sunlight that spring brings" did not sound like his usual. The opening is sunny and citrus-y, and within seconds the notes reorganize themselves to reasonably render the idea of daffodils, freshly picked, with the dew still on the petals. If you close your eyes and focus, you might pick out some of the notes in the list (for a few brief seconds, it could almost be a hyacinth soliflore) but it really works better if you don't. If you close your eyes and don't focus, it's a sea of muted gold warmed by the sun and touched by a light breeze, with pale green accents and a light hint of floral spice. The dry down, as you'd expect, is a bit more diffuse. It's softer and a bit creamier, less radiant, less springlike. It stays in pastel colors, now more buttery-yellow than gold, and there's a little hum of earthiness under the woods and balsams. And here is where I start quibbling. You know that lovely thing that happens when you wear a fantastic perfume, and every once in awhile you forget what you're wearing for a second and wonder where that gorgeous smell is coming from? With Ostara, I'd forget what I was wearing and wonder why I was catching a whiff of laundry detergent. Mind you, it's not that clean, not when you're paying attention. But there's a definite undertone of clean. Sometimes it seemed more assertive and sometimes less, but I found it disconcerting. Verdict: Ostara is gorgeous; if you don't mind clean notes as much as I do (and most people don't) you might adore it, and anyone who loves spring florals ought to at least give it a try. I gave it more trials than usual, and a few times it almost made my buy list. If I was still buying decants, it would be on that list. 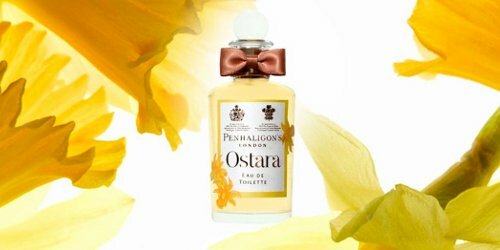 Penhaligon's Ostara is available in 50 ($120) and 100 ($150) ml Eau de Toilette. For buying information, see the listing for Penhaligon’s under Perfume Houses. 1. Ostara is the namesake goddess of Easter; see more at Wikipedia. 2. "The illusion of daffodils is completed with a floral bouquet: ylang ylang is present to add yellow, cyclamen brings the suggestion of morning dew, hyacinth for green freshness, wisteria as another narcotic spring flower, and hawthorn for its hedgerow effect." Read more at Ostara: A Master's Secrets at Penhaligon's. And see also: Never At Sephora - Bertrand Duchaufour At The Launch Of Penhaligon's Ostara at Persolaise. Glad I am not alone in being so persnickety. The opening really is marvelous. This is what I disliked in the new Malle, Cologne Indelibile. Too much white musk. Ugh, laundry white musk is usually a deal breaker. I wish white musk was banned..idk what would replace it..don’t care, I hate it. Do give it a try, it’s awfully pretty and I feel like a curmudgeon for not loving it. Don’t be I do know the feeling…some perfumes is in a stunning bottle..the opening is perfect…but when you come to the dry down..it let’s you down It has happen to me a few times.. Thanks. I do think many people will love this one though. It’s not shallow to respond to graphics or physical design ( like the bottle). You are hoping the artistry expressed in the design says something about the artistry of the fragrance. That’s all. But it doesn’t mean that pretty people are always smart, for heaven’s sake. I really liked the opening, especially the part when it was all daffodil on me. And I, too, had some issues with the drydown, but it was more that I just forgot about it, lost interest somehow. So I’m not even quite sure what the later stages smelled like. I’ve only tried it twice, though, I think I might give it another go. I don’t genreally care much for Penhaglion’s, although Juniper Sling is interesting and the gift sets are lovely. If Juniper Sling had a bit more zing I might love that one too. I think that’s my Penhaligon’s story…mostly “almost”. I do want a bottle of Elixir though. I love Elixir – it is my only Penhaligons scent. I still need to try Juniper Sling, I think I’d like it. Thanks so much for reviewing this, Robin. So, you did not notice, as one reviewer did, “wet, rotting, green weeds?” I dislike smelling like laundry detergent, but I dislike smelling like rotting anything even more. Well, gosh, no, but then it’s the rare green note that I do not like. So not sure I’d recognize the rotting weeds! From what I’ve read, a daffodil/narcussus note can be quite polarizing. Those who don’t like that note often describe it in the same way that the reviewer you quoted did. I think if you like the note, Ostara does it really well. It certainly does not have the gravity or weight of something like vintage Caron Narcisse Noir where there is an exquisite tension that can verge on discomfort in the same way that many indolic scents do. Narcissus normally smells like petrol and horse stables to me, I’ve never thought of rotting green weeds (that would be JAR Jardenia). And to me, Jardenia is mushroom (although I did like it the one time I smelled it). I really liked my first test of Ostara – I actually had Pichola on one hand and Ostara on the other. It seems quite clear that they’re out of the same stable, as it were, but I had a definite preference. Pichola’s got a nicer drydown, but it’s also got that earthy swampwater thing that seems to pop up so often with Duchaufours, and which I really dislike. In actuality, I would have said that Ostara doesn’t have much of a drydown at all, just fades away from spring florals to a quiet hum of almost nothing. I suspect that I am bothered less by musk than a lot of people are – but if I *do* get that overly clean thing I dislike it. Whoops, posted too soon. Meant to add that I think Ostara is really lovely, and I was very glad there seems to be no hint of nasty sour swamp thing in it. Ah, and will review Pichola later this week, maybe — I really like that one too, AND TDC I Miss Violet, so I’m having a little Bertrand Duchaufour thing going on here right now. I love the deviation from ‘that lovely thing that happens…’ to your nonplussed nose wondering where the detergent is coming from! Something similar: a local shop gave me a spray of L’Incendiaire (very kind as I assured them I would never ever buy it anyway) and I was walking around feeling very unimpressed with it. Not to say anything about the scent – it just didn’t appeal to me. All of a sudden I detect a beautiful sweetness coming out and I think ‘Oh no! I can’t afford to love this Seconds later I realize I am smelling Misia, which I tried upstairs. Expensive but not THAT expensive. For some reason your review made me think of Malle’s Magnolia. Is there any similarity? Oh, how funny!! I sent my Incendiaire to Kevin because I did not love it and you had me worried for a minute there — that maybe I’d dismissed it too soon! We’ll see if Kevin loves it. To me, FM Magnolia is a great scent in some category (cologne, I guess), but not a great magnolia soliflore — this really is a soliflore. My reaction to L’Incendiaire was that they were trying to make it smell expensive. Admittedly I’m prejudiced against very spendy fragrances. I’ve only tested Ostara once. I loved the exuberant radiant opening, and was hoping I’d experience the zing of hyacinths and I did. Yay! I absolutely adored the initial few hours, and then it faded into meh. Like Annikky and mals, I found the drydown to be forgettable. I don’t recall a laundry detergent note, but then again I don’t recall anything after the first few hours. I completely lost interest. I’m on the fence regarding this one. Hah, you too! Of course, re-applying could be an option. Compared to some other scents that I could name (OK, I’m looking at you, La Pausa! ), a few hours is not that bad. Interesting, maybe this is a more common reaction than I guessed. I’ve used up my sample of Ostara in record time and see a bottle in my near future. Here in northern New England the daffodils are finally in bloom so I’ve had a chance to do a side-by-side comparison. Ostara is very close to the real thing, a fragrance I find myself yearning for in the long winters. I’m really happy to have found it as a soliflore. The soapiness of the drydown is present but not very pronounced on me, so I don’t mind it. There’s also a bit of soap in the two other scents I rely on for a narcissus note, Le Temps d’Une Fete and Chamade, but somehow the earthiness of narcissus balances that for me. And I don’t get the rotting weeds thing at all, just a nice fresh green. Yeah, no rotting weeds in Ostara (but I sure get it in a number of other Duchaufours). Sometimes I wish Duchaufour would just spare us the heart-breakingly beautiful top notes so that I wouldn’t feel cheated when they depart so quickly, even though the rest of the perfume is better than most. But it sounds like it’s the heart of this one that’s the best? It isn’t 15-20 minutes of glorious then a quick fade to meh. I’d say I love it for about an hour or more? And some above say it does not last on them but I did not have that experience. I did not time it but it lasts as well as I’d expect an EdT to last. And I do think I’d even like the dry down if it were not for the detergent thing. I love the flower narcissus and its slightly horsey hay like smell. I love daffodils too and when it comes to scents Vol de Nuit, Eau de Narcisse Bleu and L’AP Fleur de Narcisse are up there with my favourites so in theory this is a shoo-in. And I do like it very much indeed. For about 4 hours. My problem with the base is that it reminds me of Amarinthine (apologies for spelling) which I sometimes like and sometimes hate. It is not quite so sweet/condensed milk but sometimes it strays a little close. Interesting, I did not think of Amaranthine — thanks! Satorial is the only one I find fb worthy. Tried the new ones, Empressa =Coco Mademoiselle returns? Lothair, aftershave+tropical fig..Levanthum, kind of generic smelling rose oud combo..none were winners for me.